The Huskies fell five spots after their overtime loss at Oregon. At No. 25, Cougars jump in the rankings for the first time this season. 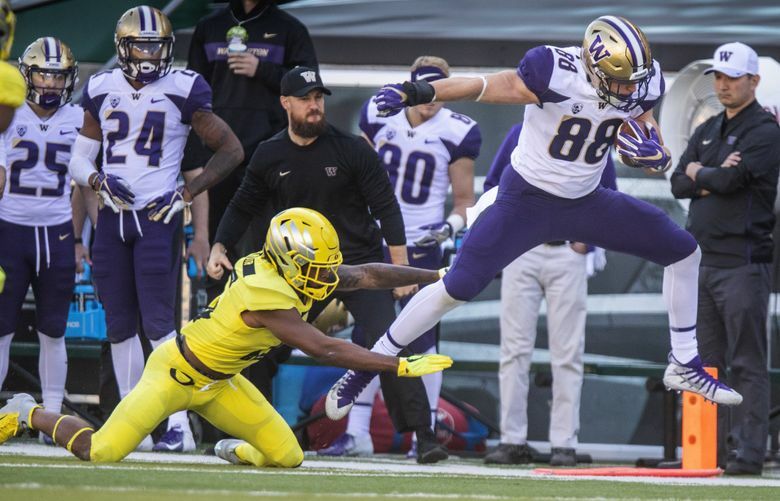 A day after their overtime loss at Oregon, the Washington Huskies dropped eight spots to No. 15 in this week’s Associated Press Top 25 poll. Following back-to-back road games, the Huskies (5-2, 3-1 Pac-12) return home this week to host Colorado (5-1, 2-1) for a 12:30 p.m. kickoff Saturday at Husky Stadium (Fox). The Buffaloes dropped out of the top 25 after a 31-20 loss at USC on Saturday night. Oregon (5-1, 2-1) rose five spots to No. 12 after its victory over the Huskies. Meanwhile, even though Washington State was on its bye over the weekend, the Cougars moved into the AP top 25 for the first time this season, making their debut at No. 25. The Ducks’ upset of UW, coupled with the WSU sneaking into the rankings sets up a big showdown between two top 25 teams in Pullman next Saturday. As a bonus, ESPN’s “College GameDay” announced on Saturday night that the show is heading to Pullman this week for the first time ever. Cougars fans greeted the news with jubilation and WSU announced Sunday afternoon that tickets for Saturday’s game against Oregon are sold out. The College GameDay truck will arrive in Pullman on Wednesday, and as WSU Athletic Director Pat Chun pointed out on Twitter, it will likely be met by a bevy of excited Coug fans. On Sunday morning, Chun tweeted a photo of some WSU athletic officials on a conference call with ESPN’s College GameDay personnel. Hosting College GameDay next weekend will be particularly special for the Cougs because it marks the 15th anniversary of the Coug flag’s — better known as Ol’ Crimson — first appearance flying in the background behind the College GameDay anchors.